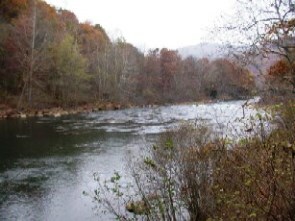 4.0 mi southwest of Piedmont, W. Va., at mile 59.4. October 2003 to current year. GAGE.--Water-stage recorder and crest-stage gage. 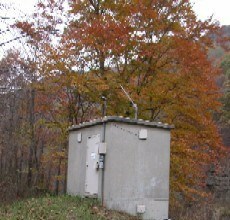 Datum of gage is 1,151.28 ft above North American Vertical Datum of 1988. REMARKS.--Prior to July 1981, regulation of low flow by Stony River Reservoir, 39 mi upstream from station (see station 01595200). Since July 1981, complete regulation by Jennings Randolph Lake, 1.7 mi upstream from station, capacity 96,600 acre-ft.
U.S. Army Corps of Engineers satellite data-collection platform at station. minimum discharge, 0.91 ft3/s, Aug. 12, 1981.